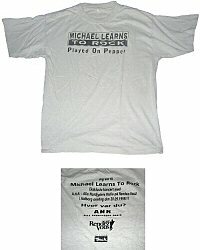 Michael Learns To Rock - Merchandice - T-Shirts - Played On Pepper (at MLTR-Universe.dk) I was at Michael Learns To Rock Exclusive concert with A.N.R. Radio at Rendez-Vous in �lborg Wednesday September 20. 1995 Where were you ?